Chicago, IL - Doctors from Massachusetts are reporting this week a way to help people with stroke, the third leading cause of death in the United States. Presenting a study at the world's largest medical conference, the doctors show that having a portable CT scanner available in an emergency room can help speed diagnosis and make better treatment possible for people suffering from strokes. Rapid diagnosis can help people recover from strokes, the doctors say, because it increases the chances that they will qualify for treatment with the drug t-PA, the only anti-stroke drug approved by the U.S. Food and Drug Administration (FDA). The drug can dramatically enhance someone's recovery from stroke, but its effectiveness diminishes over a relatively short time. A 2004 clinical trial conducted by the National Institutes of Health found that people treated with t-PA within 90 minutes of the onset of stroke showed the most improvement, but the same study found that there is no benefit when treatment is given after several hours. Current clinical protocols recommend t-PA treatment should be given only within 180 minutes of the onset of stroke. "Time is of the essence," says David Weinreb, whose report at the Radiological Society of North America (RSNA) meeting in Chicago this week shows a potential way to speed things up. One of the biggest bottlenecks is the fact that t-PA cannot be administered to someone with stroke until after they have been given diagnostic CT scan. 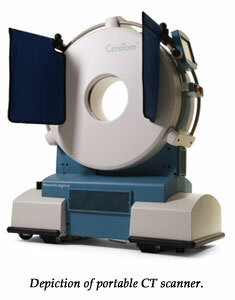 CT, or computed tomography, is a common technique that uses X rays to provide cross-sectional snapshots of the brain. Doctors can use these images to definitively diagnose a stroke and its cause. The cause of a stroke is a crucial piece of information because not all strokes are the same. Most occur because a clot forms obstructing a major vein in the brain -- similar to a heart attack, where a clot obstructs blood flow to the heart. The drug t-PA is an effective therapy for people with this most common type of stroke because it will dissolve the obstruction and help restore normal blood flow to the brain. Doctors can't just administer t-PA to every stroke victim, however. About 5 percent of strokes are caused by bleeding in the brain (rather than obstructions). Giving t-PA to people who have had this type of "hemorrhagic" stroke would make their problems worse. CT can determine if there is bleeding, and if doctors can ascertain quickly enough that there is no bleeding, they can administer t-PA. Ordering a head CT may be unavoidable, but it is not unproblematic. It can slow down the diagnosis and move people beyond the 3-hour window of eligibility for t-PA treatment. Delays like these are one of the reasons that very few people who have strokes are actually eligible for the drug, says Weinreb. This is particularly true in small community hospitals that do not have dedicated CT scanners in their emergency rooms, such as North Shore Medical Center-Salem Hospital in Salem, MA, where Weinreb and Stahl conducted their study. However, Weinreb and Stahl found that the availability of a smaller, portable CT scanner cut the time it took to obtain a scan once ordered by an ER doctor in half (from an average of 34 to 15 minutes). They estimate that this would increase by 86 percent the number of stroke victims who would make the three-hour window and qualify for t-PA.
"The advent of more and more portable devices like this one is obviously opening up new opportunities for patient management, but we need to proceed with cautious enthusiasm," says Maryellen Giger, a professor of radiology and chair of the Committee on Medical Physics at The University of Chicago, who was not involved with the study. "CT scanners have traditionally been located in radiology departments where they have been heavily tested and operated by imaging specialists," Giger adds. "If we put these devices on wheels and cart them into other areas, we need to validate that the appropriate level of safety and interpretation quality will follow them from room to room." Medical physicist Mahadevappa Mahesh also advocates caution. 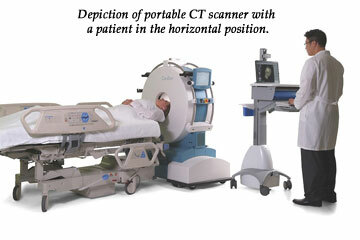 "Even though these limited-functionality portable scanners will aid in diagnosing stroke at a crucial time allowing better intervention, it is important to pay attention to the possibilities of additional CT scans during someone's stay in the hospital," says Mahesh, who is the Chief Physicist and Assistant Professor of Radiology and Cardiology at Johns Hopkins Hospital. "Clinicians should pay considerable attention to the possibility of repeated CT scans and seek to minimize the overall radiation burden."